This tortoise is munching on rocks at Joshua Tree National Park. Snacking on rocks is not uncommon for turtles and tortoises. Both nibble on rocks occasionally either by accident, out of boredom, or in an effort to get more minerals. That, or they’re secretly geologists doing mineral identification tests. This desert tortoise is a Gopherus agassizii, one of California’s state reptiles. They spend roughly 95% of their time underground, using the sharp claws on the end of their stubby elephantine legs to dig burrows. They hibernate in the winter and estivate in the summer, sleeping through the worst desert weather. After 15 to 20 million years of slow-but-steady existence, tortoises are currently a threatened species. This is in part because of a respiratory illness easily transmitted during social behaviour, but they are also threatened by human interaction. People illegally handling the tortoises can transmit disease, or scare them enough into voiding their bladder and robbing them of vital fluids. 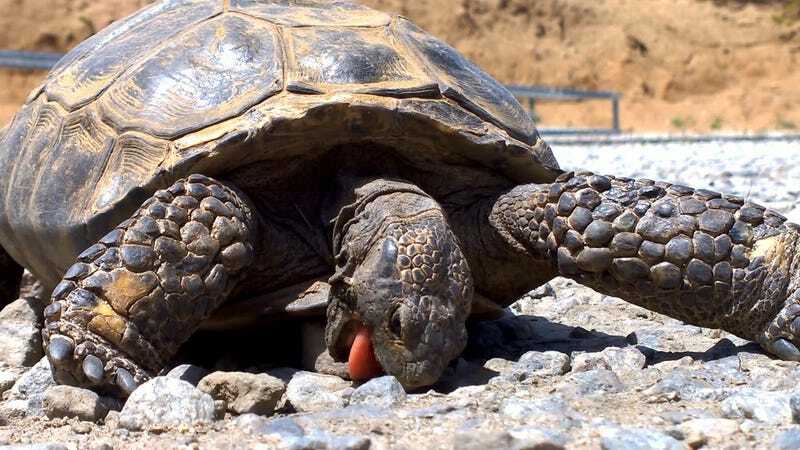 Find desert tortoises in Joshua Tree National Park (just keep your hands to yourself!). Like other national parks around the country, they will be open on Black Friday as an alternative to rampant consumerism.